AJC Core Cutter - This is a quality tool make from chrome-alloy steel and is heat treated! 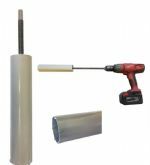 This core cutter also features space-saving removable handles that can be stored inside the tube! AJC Power Core Roof Cutter – This core cutter uses a heavy duty threaded rod to power the cutting tube. Once the core has been taken, just reverse the drill and eject! Get all the details on our core cutters and core drill bits below. If you have any questions, please feel free to contact us!